NOTE: This is a page in which is still very much in process and includes me thinking out loud about JOHNSTONs. Update: The family tree which I had included has doubled in size, and is hyperlinked to my rootsweb tree, so you can see the detail which I have also shared in that tree..
Update: September 24, 2014. Fixed broken hyperlink. Update September 29, 2014. New dates for Angel WRAY; new link to 1775 sale of land; new hunch about parents of John JOHNSTON b 1830. Going from an 1881 document concerning the COULTER Estate, it first appeared that Woodvale was in the Townland of Ducavan, Parish of Roche. What confused me about this is that although a Thomas JOHNSTON was the immediate lessor of all of Ducavan in 1854, there was no building or set of buildings in that townland worth more than £1.0.0. And Woodvale was supposedly a building of some substance. Then a conversation with Eilie RYDER née McBRIDE who was born at Freeduff in 1920 tipped me off about a new place to look. She recalled visiting Woodvale in the 1930s. Her older brother Billie was engaged at the time and the family visited the JOHNSTONs as part of the rounds that one did at such a time. This wasn’t long after Billie and Eilie’s sister Mary Francis McBRIDE, a promising second year medical student at Trinity, had tragically died of TB that she caught during her medical rounds. The grief over her death was still hitting the family hard and although that may have not been the cause, this engagement didn’t result in marriage. But back to Woodvale. Eilie remembered that the farm was situated such that it straddled the border between Armagh and Louth, a convenient placement in those times for all sorts of reasons. This was curious since Duncavan was not on the border. Eilie also told me that the house was a substantial 2 story house. Although there was “no cordiality with the Johnstons” and the McBRIDEs, they were still “cousins” of her father and therefore needed to be included in the family social circles. They were likely 2nd or 3rd cousins since Dr. William Scott McBRIDE, their father, had only one sibling - a brother Alfred who died unmarried and without issue. HUNCHES? When it comes to possible relations, the Freeduff Church records show an Olivia DONALDSON & an Alexander JOHNSTON of Cloghog having 3 children: Mary Jane b.1863; John James b. 1865; and a second Mary Jane b. 1869 (presumably the first one died in the interval). 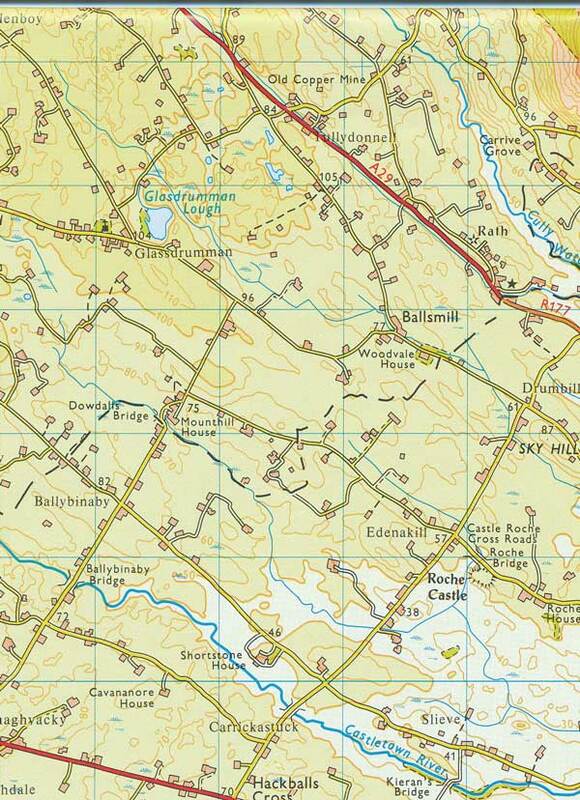 Thanks to Pete Schermerhorn, master of all things map related, I then learned that Woodvale was actually in the townland of Glassdrummond: ...And there is Woodvale House ... between the border and the road fork in Ballsmill village - it looks as if it's the very first place on your left after you cross the border from Louth into Armagh (perhaps an "active" place, during the Troubles). SOURCE: Discoverer map Number 28 - First Series, published in 1982. In a second email, Pete added: ......the road into Ballsmill is a minor, unnamed/unnumbered road. There are some areas off woodland shown around Woodvale House, and across the road. Perhaps a demesne? Currently, there are no lakes beside Woodvale, but then Pete Schermerhorn had a great thought: There may not be a lake now, but the stream running along the north side of the road at Woodvale may have been dammed at some time. After all, Ballsmill implies some sort of "mill", and water power was always a good option when available. And I suspect that the Woodvale estate included that land across the road (a bit wooded on the 1982 NI map). If you look at the watercourses across the border into Louth, you'll see some definite straightening of the stream bed which actually forms the boundary between Tatnadarra and Drumbilla townlands - so the stream had been "managed" for a long, long time. I would suspect that somewhere near the Armagh/Louth border, there was a dam on that stream, to form a reservoir or lake. A Creggan Church record (see beneath under my notes on JOHNSTON) placed Woodvale in the townland of Glassdrummond. Although a Thomas JOHNSTON was the immediate lessor of all of Ducavan, there was no building or set of buildings in that townland worth more than £1.0.0. So, it seems that he lived at Glassdrummond and held leases for Ducavan. NOTE: Ducavan is a townland of 99 acres with Shortstone East and West on its southern border, Ballinbinaby on its western border and Edenkill aka Edenakill on its northern and eastern border. Descendants of John Johnston Updated: April 16, 2014. I suspect that the tree above is connected to the one beneath. I will be looking for these links when I am next in the Deeds Registry in Ireland. NOTE: My most recent best guess is that John JOHNSTON is the son of James JOHNSTON of Water Lodge, Co. Armagh and Mary BALL, the 3rd daughter of Samuel BALL (1757-1843). JOHNSTONs were originally Presbyterians, adventurers stationed at the Fews Barracks. SOURCE: An Account of The Barony of Upper Fews in the County of Armagh. Jon Donaldson. p11. SEE: http://www.archive.org/details/redmondcountohan00carlrich for an account of Redmond Count O’Hanlon: The Irish Reparee by William Carleton. It would seem that “my” JACKSON family and the JOHNSTONs were close – in death, if not in life because in 1785 in the Creggan Vestry records, there was a note made about arrangements for graves: JOHNSTON-JACKSON. 26’ by 16 ft of ground granted to John JOHNSTON Esq. Of Woodvale in the S.W. corner with liberty to enclose same and 16 feet square to Mr. David JACKSON & family adjoining Mr. JOHNSTON. A Richard JOHNSTON married Anne JACKSON sometime in the late 1700s. He was quite possibly the Richard JOHNSTON referred to in the 1753 will of John JOHNSTON as the child of his housekeeper, Catherine DARBY. If he was the child of John JOHNSTON (and the will bequest leads me to believe this), then he was also a half brother to Thomas, Graham, John, Ann and Charity JOHNSTON. The John JOHNSTON who was a half brother to Richard JOHNSTON, was the 3rd legitimate son of his father, John JOHNSTON, Known colloquially as “Johnston, King of The Fews” (a disparaging nickname – he was a much hated “tory” hunter). He had 3 sons: John, the eldest of Longfield; Thomas (who died before 1830) and James of Woodvale. I would expect James JOHNSTON to be the ancestor of the JOHNSTONs of Woodvale in the 1930s. In the 1862 Thoms Directory, a Thomas JOHNSTON is listed as a magistrate from Longfield, Carrickmacross, Co. Monaghan. Standing in what is known as the "Ball Enclosure", this headstone is a memorial to Elizabeth Page, daughter of Captain Sam Ball, Crossmaglen, a descendant of Thomas Ball, the military adventurer who was granted 5911 acres of land in the Baron of Upper Fews at the time of the Cromwellian Plantation. Thomas Ball may have lived at, or on the site of, "Woodvale House" for some time, as the Hearth Money Rolls of 1664 record that he paid on four hearths in the townland of Glassdrummond. "Woodvale House", occupied by the Johnstons of the Fews in the 18th. century, stood in the townland of Glassdrummond. The name of the village adjacent to the house may have been changed by the Johnstons from Ballynaclera to Ballsmill. The Ball surname is also preserved in Camlyball, a townland near Newtownhamilton. SOURCE: Creggan guide to Creggan Church and Graveyard. Kevin McMahon and Jim Murphy. Page 45. 1775 June 11th sale of lands. Belfast Newsletter. NOTE: At time of Griffiths, a Thomas JOHNSTON leased 21 acres od Camly (McCullagh) from Reps of John REID. Thomas Ball paid Hearth Roll Tax for 4 households in Glassdrummond – possibly including Woodvale. Indenture between James JOHNSTON of Woodvale in the County of Armagh Esquire and William JOHNSTON of Dundalk in the County of Louth Doctor of Medicine of the first part and Elizabeth Jackson of Urker in the County of Armagh Widow of the second part. John JOHNSTON of Woodvale, Ballsmill, owned 79 acres in the 1876 Landowners list. He was a Justice of the Peace. DUCAVAN: John Miss M.E. JOHNSTONE, Woodvale, Ballsmill, Hackballscross, Dundalk. He has no agent. SEE: Coulter Estate document. Letter from Eliza JACKSON née OLIVER: Mr Johnston of Woodvale is now Agent to the Ball estate. I hope we will soon get our affairs settled; & we can settle any [day?]. He dined with us, one day lately; & advise very favourably dispensed. All the books & accounts of the Estate are to be given up to him on the 10th inst. Mr Brooke has made a total mess of his employers business in more cases besides ours. SEE: 1884 June 4 Letter. Son Farmer & Justice of the Peace. John JOHNSTON, the 3rd son of JOHNSTON of the Fews. David JACKSON (aft 1755-1796) son of George JACKSON & Margaret M’LOUGHLAN. A Richard JOHNSTON was the husband of his sister Ann JACKSON. They married 1767 at Creggan Church. I am assuming that this Richard JOHNSTON was the half brother of John JOHNSTON, born of a relationship that the John JOHNSTON sr. had with his housekeeper, Catherine DARBY. Jackson WRAY. In 1828, there was a reference to a Rev. Jackson WRAY. I don’t know if he is the same one. SOURCE: 1829, Jan 11. Newry Commercial Telegraph. · Belfast Newsletter 1752 Jan 19 The Lordship and Manor of Forkhill in the County of Armagh, part of which is within [?] Miles of Newry and part within 2 miles of Dundalk [?] Seaport and excellent markets for linen, yarn, and a [?] Things fit for home consumption, or exportation; it be likewise a good number of inland towns, where there are fairs and good yarn markets held, within a short distance of it: the whole will be taken out of lease next May: there is a great convenience sea of turf and water, with proper falls on the river for Mills, and good ground for bleaching-greens from 3 to 6 acres, which can have the advantage of springs, with a farm to each green of about 60 acres, more or less as shall be agreed on. A gold Corn Miller, with a well attested character, will meet with employment; and there will be good encouragement given to protestant weavers, bleachers and industrious farmers, there being several thousand acres, mostly arable, to be let. For further particulars inquire of Hugh Boyd Esq. : at Ballycastle, Jackson WRAY, Esq. At Coleraine and or Richard [...] NOTE: The clipping I worked from was missing part of the right-hand margin. Ballsmill is a village of about 10 houses, 5 miles, Irish, from Dundalk, and 4 miles, Irish, east of Crossmaglen. It lies within a quarter of a mile of the Louth border and is only a mile from the famous Roche’s Castle. . . . . The land of the district is good. Potatoes, oats and flax are the chief crops. SOURCE: 1888 Bassett Armagh Directory.